On the fiftieth anniversary of Breakfast at Tiffany's, and simultaneously with the Rome International Film Festival, eternal city will be honoring Audrey Hepburn for the first time with a tribute-exhibit at the Ara Pacis Museum. This celebration of Audrey in "her" Rome will raise funds for UNICEF's project to fight child malnutrition, in conjunction with the Club Amici di Audrey (Friends of Audrey). Hepburn devoted the last years of her life to serving as a UNICEF Goodwill Ambassador. A portion (25%) of the Ara Pacis Museum entrance fee will be donated to UNICEF Italy's mission in CHAD. The Audrey in Rome exhibit is being promoted by the City of Rome Department for Cultural Policies and Historic Center - the Cultural Heritage Superintendence, the Audrey Hepburn Children's Fund and UNICEF, together with the Club Amici di Audrey at the Italy Fund for UNICEF. Zètema Progetto Cultura is handling the event's organization and museum services. The exhibition contains images, videos and personal objects that recall the three lives the actress lived in Rome: as an actress, mother and UNICEF Ambassador. Spanning twenty-five years, Audrey shared key moments of her career with Rome, from Roman Holiday to War and Peace and The Nun's Story. But more so, she shared with Rome many years of family life in close contact with the city and its residents. The exhibit is curated by Audrey Hepburn's son, Luca Dotti, together with Ludovica Damiani, Sciascia Gambaccini and Guido Torlonia, with the consultancy of Sava Bisazza Terracini. A selection of unpublished shots from the archives of Reporters Associati, Photomasi, Istituto Luce and Kobal Collection capture Audrey Hepburn during her everyday life in Rome. Captions, wall panels and graphics will illustrate personal recollections of the relationship between Audrey and Rome. 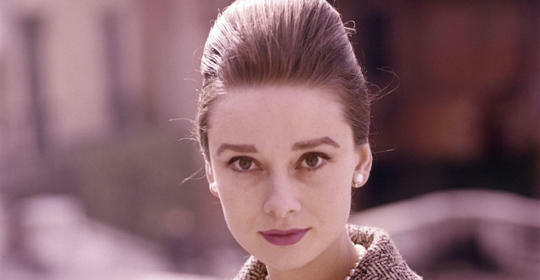 Considering the tie between Audrey Hepburn's life and style, the images come to life as they are displayed with the fashion items in the photos and which she wore during that era. Featuring creations by Givenchy, Valentino and many others, together with her 'everyday' clothes she wore in her daily life, give us an unprecedented look into the fashion of the times. The exhibit also displays pictures from UNICEF Archives which document Audrey Hepburn's missions among the children of Bangladesh, Vietnam, Somalia, Sudan, Ethiopia and Latin America, to whom she devoted those last precious years. I am sorry I missed the exhibit. I would like to buy a book from the exhibit. Audrey was a wonderful elegant lady and a talented actress. I love her!